I have found that my guinea fowl like to feed in the open so that they can flock together. 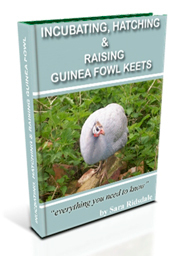 You might also be interested in the GFBA, an international association of people interested in learning accurate information about raising and keeping guinea fowl. 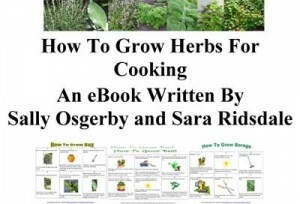 See www.gfba.org for details. Our internet group would love to hear about guineas in your country and how you manage to keep from losing them to predators when they roost in trees and live outside 24/7. Please visit us at www.guineafowl.com/board and tell us more about how you raise your guineas. Thanks for passing this information onto my readers. When I first got guinea fowl I read all about guinea fowl on the fritsfarm website and that inspired me to set up a site for the British guinea fowl enthusiast. Thanks for taking the time to leave this comment. We are investigating setting up a an enterprise rearing Guinea Fowl at the end of this year. We have had many years of expereince rearing pheasants and partridge, and have kept ducks, and peacocks. So most is not new to us, but we welcome any advice for our venture from anyone, plus information on where we can buy keets, to start us off. 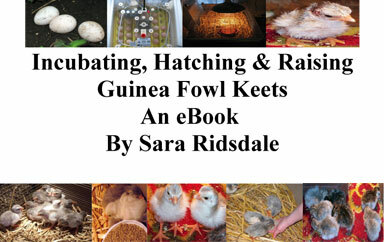 I am currently writing an e-book on raising guinea fowl which will be available soon – I will let you know when. In the meantime my guinea fowl category has lots of information about keeping guinea fowl. Can I ask how many keets you are wanting to set up with as I may be able to hatch the keets for you or know someone who can depending on the numbers? If you email me specific questions I will try to answer them for you, so don’t hesitate to ask any question relating to guinea fowl rearing. I unexpectedly received 25 guinea keets as a birthday present (I only desired two or three to keep the single guinea company on this farm since I know they tend to herd). I am not a guinea farmer and even have a hard time keeping the cat population from exploding. At any rate, the farmer I rent my home from let me use a 8×4 pen to keep them in and that seemed fine for a while. Started feeding them crushed corn on the first day and after asking folks I bought them 25 lbs “start and grow”, sometimes mixed with a bit of crushed corn. when they ran out of that I bought them some turkey feed (higher protein they say) and it sure smelled and felt richer than the start and grow. In the meantime I pulled up grass and vegetation to give them exceptng the poision oak/ivy/sumac stuff and i found that they love fishing worms and crickets. This farmer grows milo and I wasnt sure if i could just cut it off the stalk and give it to them. Oh… soon after the 8×4 cage with 25 guineas i moved them to a much larger half barn/half chicken wire type cage because i felt like they needed space. Still feeding combo of crushed corn and turkey feed… sometimes worms (i can buy those but have a hard time catching crickets). Recently we had a hurricane here (i live in Rosenberg, Texas with hurricane Ike) The hurricane tore up their home but they all survived and were still somewhat “pent up” . They look so skinny and miserable when wet. I repaired the perimeter but not the roof of this pen thinking they would not fly out while I was tending the disaster in my yard and the neighboring farmers yard but they did. I kept track of them since i thought it impossible to catch them one by one by hand. They stayed in an old one-row 1950’s cotton picker in the farmers field not far from their original home. Next morning or so I found them roaming the grounds and was happy to see ALL of them together and fed them their usual crushed corn and turkey feed in a large pan (they attacked it). The farmer’s son said they were too young to avoid predators and that we should keep them pent till they were older so we labored over repairing this barn/pen and I was wildly surprised at how easy it was for us to herd them (slowly and easily with surprisingly little difficulty) back into their home. I am anxious to let them roam the plenty room they have here. They are just starting to make the guinea noises instead of the “beep-beep” and I dont want them to be frustrated in this cage. There is a small trap door in this cage (the old farmer says open it in the morning and they will find their way dont force them and perhaps they will come in to roost at night). I have put up plenty of roosting places for them and was pleased to see them using these expensive 1-1/4diameter x 8′ poles i bought from lowes. I put them up as soon as I moved them to the larger pen and they stay there every night. The ground in their pen is bare, i bring vegetation, and now that on this site i see perhaps they like lettuce i will feed them that for sure and hope to soon let them out. I hate to lose them to predators. The farmer here has a hard time keeping chickens due to (im not sure if coyotes or wolves or the difference) but i do know that this single adult female guinea (she lays eggs and says “buckwheat-buckwheat) has survived the whole time ive been here. My original intent was two or three guineas to keep this one company (my mother lives next to a farmer who keeps guineas, peacocks, cows, asses, you name it, and hence the birthday present) so I hope to let them loose soon because I think it unnatural to keep them pent up. Nice site, and yes I like to “Meet the animals, harvest the information….” but I dont mind getting my hands dirty. Thanks for the information. They really love crickets, but crickets are so hard to catch. I have a big open field, and catch grasshoppers for my guinea hens. They go nuts, and jump into my lap to feed on them! Cocena is a local name for Guinea fowl that is still used today in South Texas. More than likely spelled “coquena” it is part of the rancho culture that is very distinct to the area. After reading your question, I verified the answer with my madre (mom), aged 84. I sure wish I could get a hold of a few coquenas for my garden. Hi Raymond, Welcome to farmingfriends and thanks for your interesting question. I am afraid that I don’t know Spanish but I have looked it up on the internet and the word cocina means kitchen. I have found that the Spanish for guinea fowl is gallineta, gallina pintada or gallina de Guinea. Hope that helps. I saw a flock of gray birds grazing in a field at the Jester Correctional Unit in Richmond Texas on Harlem Rd. They were too far away for me to get a good look at but they appeared to me to be Guinea fowl. I only remember these birds from my youth in the 5o’s or early 60’s and only new them by the Spanish name “cocena”. The spelling in Spanish may be incorrect but I can not find it in a dictionary. Do you know by any chance if a “cocena” and a Guinea fowl or hen are one in the same? I have asked other Spanish speaking people but no one seems to know.